“Don’t ignore intuitive tickles lest they reappear as sledgehammers.” That’s the first rule of Ten. Tenzing Norbu (“Ten” for short)-ex-monk and soon-to-be ex-cop-is a protagonist unique to our times. 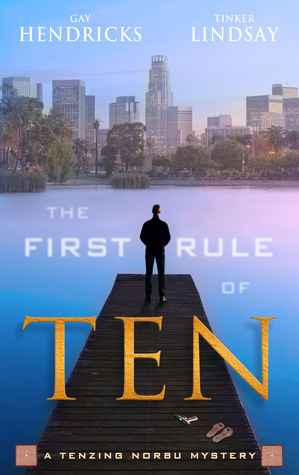 In The First Rule of Ten, the first installment in a three-book detective series, we meet this spiritual warrior who is singularly equipped, if not occasionally ill-equipped, as he takes on his first case as a private investigator in Los Angeles. Growing up in a Tibetan Monastery, Ten dreamed of becoming a modern-day Sherlock Holmes. So when he was sent to Los Angeles to teach meditation, he joined the LAPD instead. But as the Buddha says, change is inevitable; and ten years later, everything is about to change-big-time-for Ten. One resignation from the police force, two bullet-wounds, three suspicious deaths, and a beautiful woman later, he quickly learns that whenever he breaks his first rule, mayhem follows. There is a pervasive feeling of peace and serenity to this book that only takes a few pages to become apparent. This feeling continues thorugh the entire book, even when the active is thick and heavy. This was such a treat the fits so well with the main character. And what an interesting main character. An ex-monk, ex-cop private investigator? What a curious background. Ten is very likable and approachable. His first rule is a good rule to live by, and one that he instantly knows when he breaks. Something unexpected yet greatly appreciated was the cleaness of the language. The characters tend to find creative non-swear words to use. Mike, Ten’s techy friend, has some of the best substitutes ever. The intricate yet smooth plot may be common in many adult mystery books, yet it was a welcome change from the abundance of YA books I’ve read lately. This was a very welcoming book to read, and one that I enjoyed immensely.